Continuing with our adventure in the “Black Island”, Mr Muller had left Tintin unconscious in his burning house to die, but he was saved by Firemen. Thereafter while chasing Mr Muller and his goons, Tintin took lift in a red coloured car. 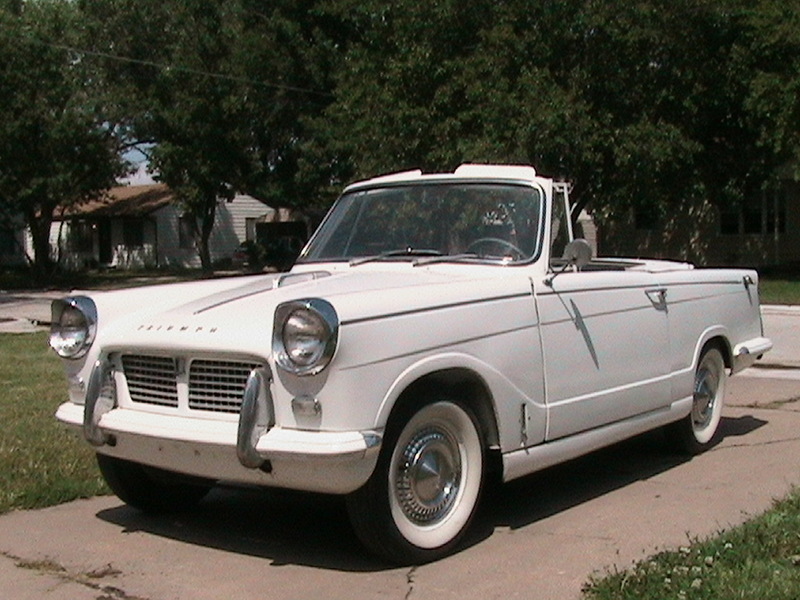 It was a Triumph Herald 1200. 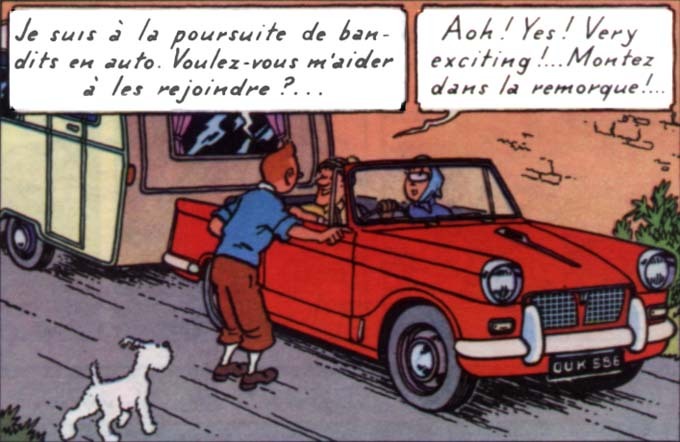 2-door convertible, the car in which Tintin took a lift. The car was designed by Giovanni Michelotti and had 93% all round visibility in the saloon version. It had razor sharp edges and fins which were a rage at the time. This car had a body on chassis construction. However, every panel, including the sills and roof, could be unbolted from the car. This allowed for different body styles to be easily built on the same chassis. Various models of these cars were powered by different engines during the life of the car. All engines were inline four cylinder petrol engines with over head valves. These engines drove the rear wheels using four speed gear boxes which had synchromesh on the second, third and fourth gears. The 948 cc engine produced 34.5 BHP that was sufficient to propel these cars to a maximum speed of 114 km/h and gave a 0 to 100 timing of a leisurely 31.1 seconds. As a result these cars were not a success when launched in 1959. 1147 cc engine was introduced in 1961 when the brand was under the control of Leyland. These engines produced 39 BHP. 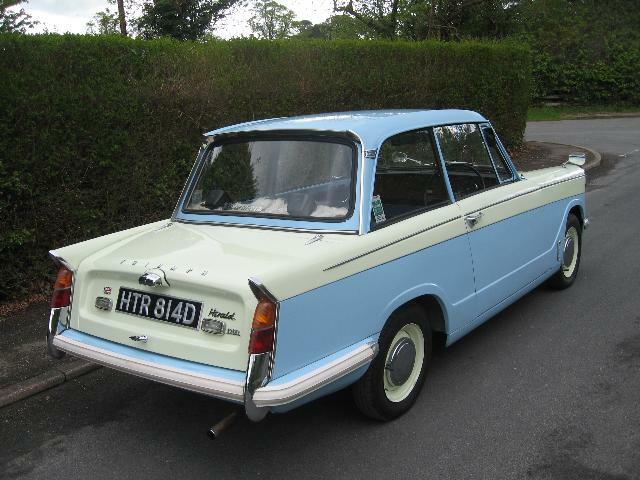 From 1963 to 1967 a sportier version, the Herald 12/60 was offered with a 1296 cc engine producing 51 BHP. Power of the 1147 cc engine was also boosted to 47 BHP from 1963 onward. Stopping power was initially provided by drum brakes on all wheels, later front disc brakes were first offered as an option and finally as standard fit. This car was introduced in India as the Standard Herald in 1961 by the Chennai based Standard Motor Products (STAMPRO). 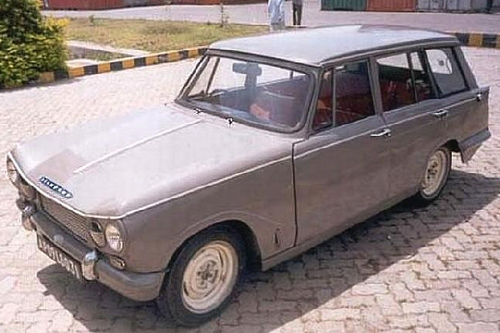 Standard Herald was offered as a 2-door saloon and a 2-door convertible in India. As a unique development for India, the Herald Mark III was offered as a 4-door sedan. 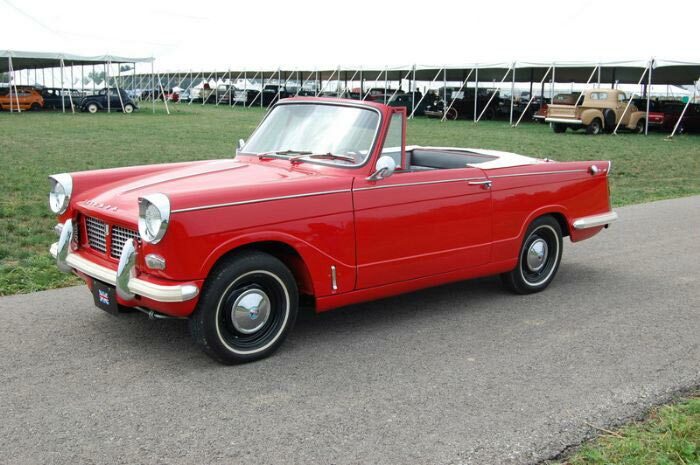 It was based on the Triumph Vitesse. This car had the front end and hood of the Vitesse with the outer headlights replaced with indicators and a four door body. Later, even a five door estate was offered. In India, the Standard Herald was powered by a 948cc engine. 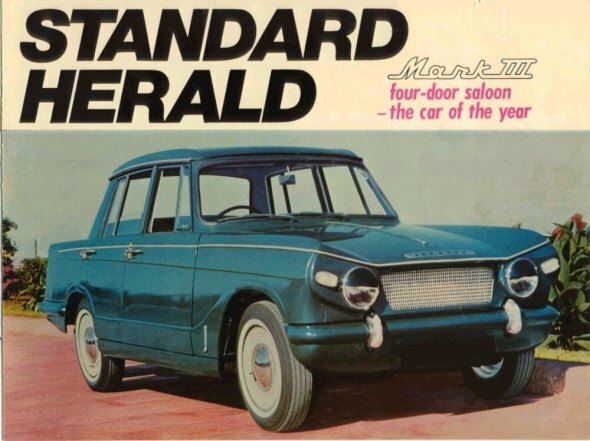 The Standard Herald was an advanced car for its time as it employed independent suspension with coil springs and double wishbone at front and an independent suspension with transverse leaf springs at the rear. As the car weighed just 787 kgs, the puny engine and the four speed gear box were able to push the Indian car to 112 kmph when driven pedal to metal. Stopping power was provided by drum brakes on each wheel. Though this car was a success in Britain, Standard could not sell very many numbers in India.